Barret Castro was born and raised in Fall River, Massachusetts and continues to reside there. He graduated from B.M.C. Durfee High School and went on to graduate from Providence College with a Bachelor of Arts degree with a concentration in Theology and Philosophy. Barret is a member of the Knights of Columbus Council 12283, serves as a Eucharistic Minister and is an ex-officio member of the parish council. Barret was the first recipient of the parish to receive the Pope Saint Pius X award. Barret likes Church history and has a particular fondness for the Tridentine/extraordinary rite and pre Vatican II Council memorabilia. When not at Saint Bernard Church you may find him at his other job working as a firefighter/paramedic for the City of Fall River. Barret has been our sacristan at Saint Bernard Church for the past 14 years. As such, he is responsible for care of the sacristy, the church and it’s contents. His duties also include the preparation and set-up of Masses, Baptisms and other Liturgical Services, restoring the sanctuary/church after these ceremonies, as well as the ordering of vestments, vessels and other items such as candles, sacramental wine, altar bread, and baptismal garments used during various services. 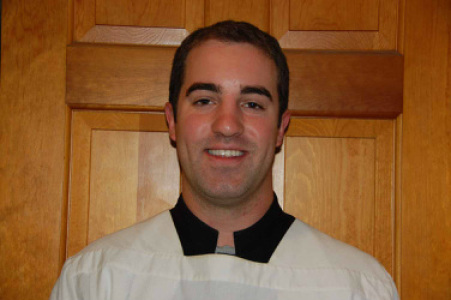 Barret also serves as the director of the office of altar servers, which includes, training, scheduling of altar servers and acting as the master of ceremonies during the Christmas Liturgies, the Easter Triduum and Easter Liturgies.